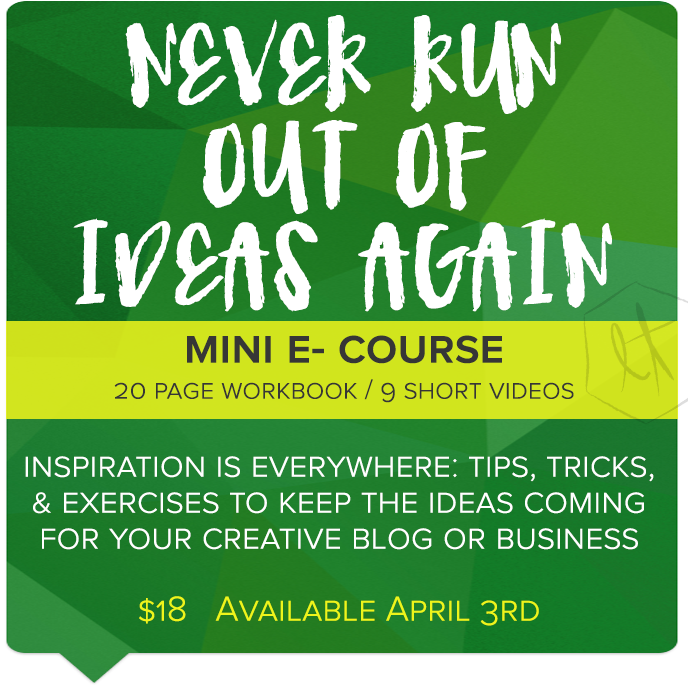 UA-59651954-28 Crafty Allie: Mini Course Giveaway "Never Run Out of Ideas Again"
Mini Course Giveaway "Never Run Out of Ideas Again"
"Never Run Out of Ideas Again". But really, I found that it really can be used on so many different levels, not just for bloggers. Well, anyway, I'll let Colleen tell you more! those people who seem to have great ideas all the time and the rest of us? They know how to trick their brains into coming up with new ideas when they’re stuck. Allowing yourself to be inspired- and knowing how to get your creative juices flowing takes practice. I’m Colleen a DIY and Lifestyle blogger at Lemon Thistle (where I talk home decor, parties, DIY, Printables and Babies) but I also contribute projects to other blogs and have blogging clients that I create content for. In any given week I’m not only creating 3 projects for Lemon Thistle, but also another 6 posts for clients/ other blogs. Plus, I’m shooting out e-mails pitching ideas. That’s a lot of content to create and a lot of ideas to generate. When I first started blogging, I didn't understand how it was possible to create fresh content that hadn't been done by a hundred other bloggers… let alone do it every week! (and it’s not a scary thing!). (and GOOD ones at that) is the topic I get asked about more than any other and hey, I get it! These strategies have helped me not only fill my editorial calendar, but have also given me more than enough ideas to pitch for future projects. My trouble is now picking which idea is the best fit/ best timed. I so hope that they will do the same for you! Don't wait to win it, buy the mini-course at a very affordable price. Plus, Colleen is giving a special 10% discount to all of you Crafty Allie Fans! To win "Never Run Out of Ideas Again"